In the old days, people needed containers to hold everything. Twined bags were made in every size to accommodate holding everything from food to sewing supplies to fire making kits. Although the vast majority of bags have been lost, there are some examples of twined bags preserved in museums. Double Vision, tells the history of how the Canadian/English and American governments have tried to for centuries to divide Native people and how we stand united to be "Idle No More." It also shows how, we as Native People, are forced to walk in two worlds. The Traditional world of our ancestors and the modern world. Previously exhibited at the Trickster Gallery, Schaumberg, Il., and Mt. Kearsarge Indian Museum. 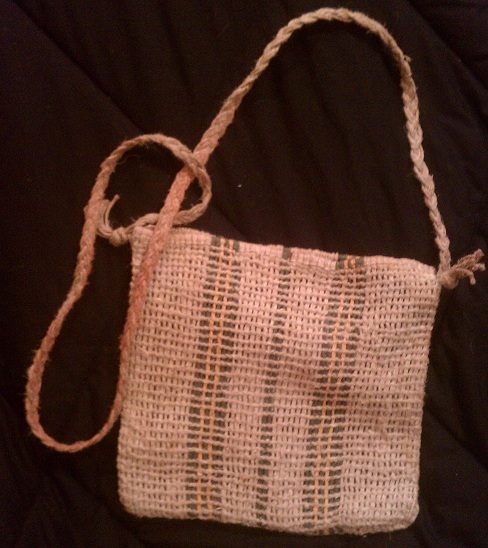 Each step in making this bag was documented, as a part of the Abenaki Ethnobotany project. The walls are open twined, and the base is closed twined that was made from 300 plants. 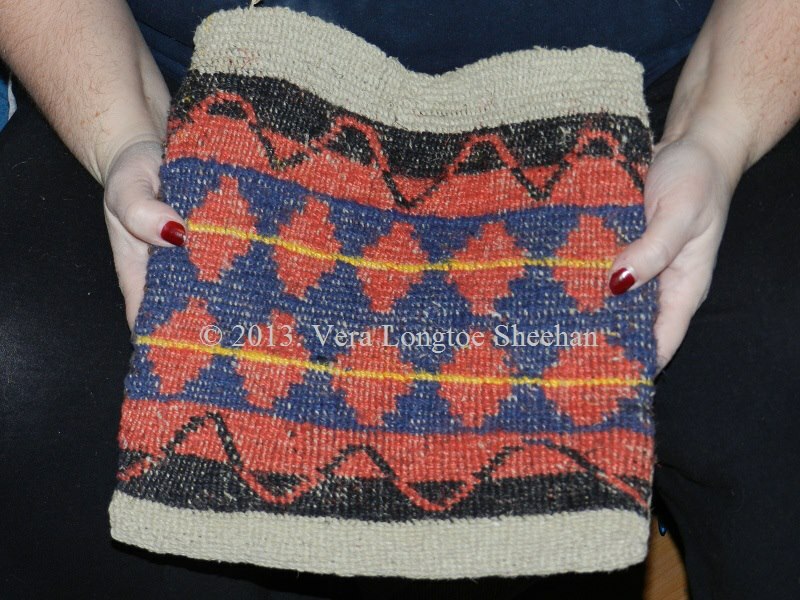 This bag will be a part of the Wobanakik Heritage Center Collection. Previously exhibited at the Boston Children's Museum, Institute for American Indian Studies, William-MacDonnel House, and Abbe Museum. Approximately 6" x 7""
Put braided strap over your shoulder and you are ready to go berry picking. Made from green and natural dogbane. 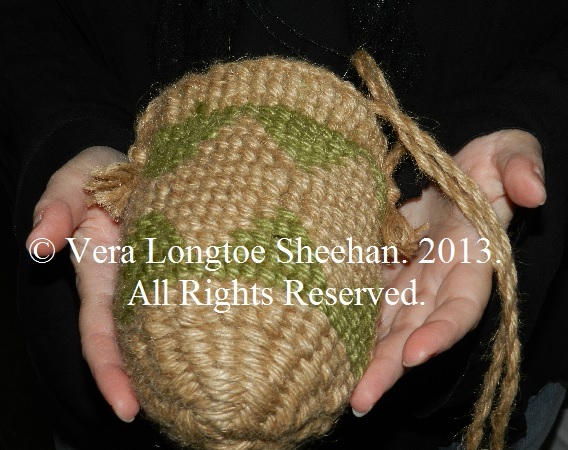 4" x 7.5"
Twined round bags like these were made in various sizes. Historically speaking these are referred to by the Lewis and Clark expedition. They are sometimes referred to as "Sally Bags." Smaller ones could hold enough cornmeal rations for a few days and be kept tied at your side. Previously exhibited at the Boston Children's Museum, Institute for American Indian Studies and William-MacDonnel House. Made from natural unpolished hemp. 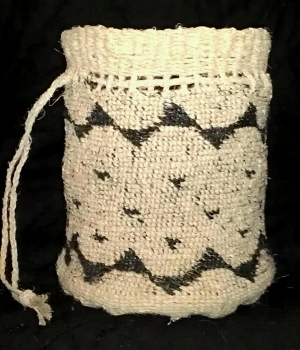 Round bottomed twined bag with a geometric pattern. The perfect size to hold your eye glasses. Made from natural and black hemp. 2 1/2" wide x 6" tall. Open twined bag with braided strap. This size bag, makes a great shot bag or shoulder bag. The more you use these bags, the softer they feel. Natural green and gold hemp Previously exhibited at the Boston Children's Museum, Institute for American Indian Studies and William-MacDonnel House. Approximately 8" wide x 8.5" tall. 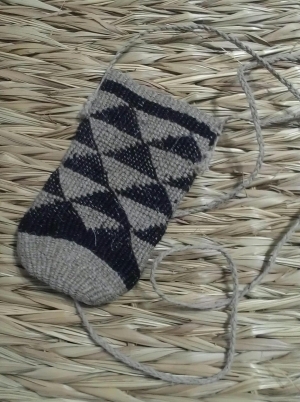 This bag was twined using both the closed twining and diagonal twining techniques. This size bag, makes a great shot bag or shoulder bag. The more you use these bags, the softer they feel. Previously exhibited at the Boston Children's Museum, Institute for American Indian Studies and William-MacDonnel House. Made from natural and white hemp. Closed twined with braided strap. The perfect size for a medicine bag. 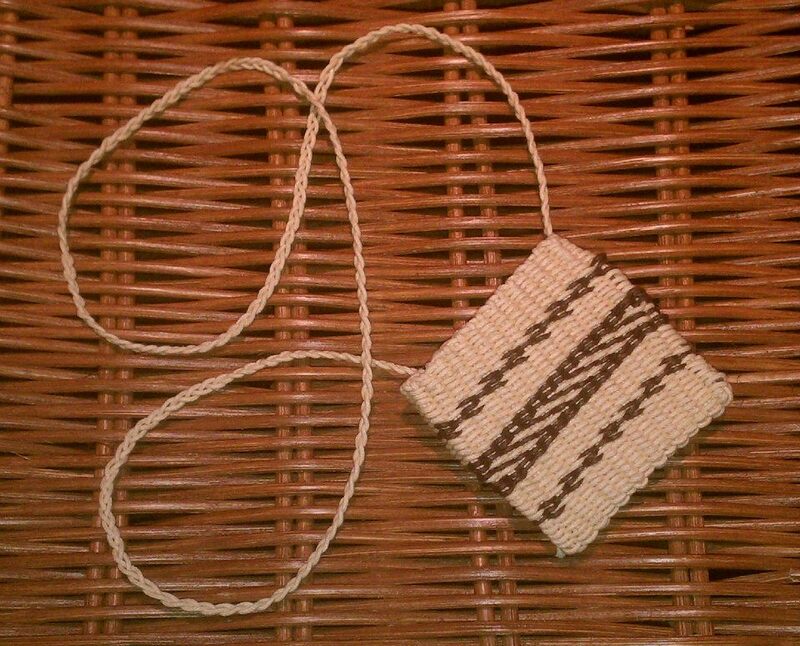 Made from cotton cord. Uncommon Threads: Wabanaki Textiles, Clothing and Costume exhibit, on display at the Maine State Museum 2009-present. Co-curated by Laureen Labar and Bruce Bourque.